Supreme Court Strikes Down D.C. Handgun Ban The Supreme Court for the first time ruled that the Second Amendment guarantees individuals the right to own a gun. The 5-4 opinion said the justices expect new cases to test the boundaries of government limits on those lawfully held guns. The Supreme Court strikes down the District of Columbia's law banning the possession of handguns. The Supreme Court for the first time ruled that the Second Amendment guarantees individuals the right to own a gun. The 5-4 opinion said the justices expect new cases to test the boundaries of government limits on those lawfully held guns. The United States Supreme Court, for the first time, has ruled that citizens have a right to keep guns in their homes for self-defense. The court was sharply divided, 5-4. In the majority: Justices Scalia, Alito, Kennedy, Thomas and Chief Justice Roberts. 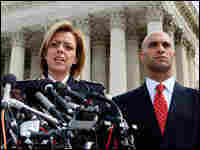 Dissenting were Justices Stevens, Breyer, Ginsburg and Souter. In a moment, we'll get reaction from Los Angeles Police Chief William Bratton. First, though, the ruling itself. It struck down a ban on handguns that has been in place in the District of Columbia for 32 years. NINA TOTENBERG: Wrapping up the court term today, the justices almost literally issued one final bang. With scattershot imprecision, they set up a large target for future court challenges to gun restrictions across the country. National Rifle Association chief lobbyist, Chris Cox. Mr. CHRIS COX (Chief Lobbyist, National Rifle Association): This fight is only beginning. TOTENBERG: And yet, today's Supreme Court ruling is relatively limited, at least for now. The immediate issue before the court was a total ban on handguns in the District of Columbia. It was challenged by a security guard who wanted to keep his gun in his home. To decide the case, the justices had to rule directly on the meaning of the Second Amendment, a provision with only 27 words: A well-regulated militia, being necessary to the security of a free state, the right of the people to keep and bear arms shall not be infringed. For most of the last century, the courts have interpreted that provision as a collective right associated with arms for military service. But today, after decades of effort by gun rights activists, the court declared the right to keep and bear arms is an individual right aimed, at the very least, at citizens protecting home and hearth. Writing for the five-justice court majority, Justice Antonin Scalia said, handguns are the preferred weapon of self-defense in part because a handgun, quote, "can be pointed at a burglar with one hand while the other hand dials the police." A total ban like the District of Columbia's, he said, is unconstitutional. However, Scalia went on to suggest a string of limitations on that right. Nothing in our opinion, he said, should be taken to cast doubt on longstanding prohibitions on the possession of firearms by felons and the mentally ill, nor should it cast doubt on laws banning guns in places like schools and government buildings, or laws that impose conditions and qualifications on the sale of guns. Scalia acknowledged that the court today was not setting out the full scope of what regulations are and are not constitutional. Indeed, he conceded, the court was not even establishing a clear guide or standards for evaluating what are reasonable restrictions on gun ownership and use. That leaves open dozens, if not hundreds, of questions to be answered by the courts in the coming years. Today's decision applies only to federal laws since the District of Columbia is a federal enclave. So gun rights activists are expected first to challenge state and local bans or near bans on handgun ownership - in Chicago and its suburbs, for instance - to see if the Second Amendment applies to the states. But there are dozens of other unresolved challenges expected - challenges to waiting periods for buying a gun, bans on gun ownership in public housing projects, bans on gun ownership for people who've had restraining orders issued against them in domestic violent situations. Criminal defense lawyers are expected to challenge sentencing enhancements based on gun possession. The list goes on and on. Gun rights activist David Hardy. Mr. DAVID HARDY (Gun Rights Activist): Registration systems? Don't know. Pistol permits? Don't know. TOTENBERG: Nor did the courts say whether certain kinds of assault weapons can be banned. Again, David Hardy. Mr. HARDY: If it's a weapon that is not in common use, then it can be banned. So by that, I would think we're talking more like artillery. If you're talking semiautomatic, sub, almost everybody's got a few. TOTENBERG: The court's opinion says only that historical tradition would seem to support a ban on, quote, "dangerous and unusual weapons." Elsewhere, there's language that suggests a ban might well be permissible on fully automatic assault weapons, an M16, for an instance, with which the triggerman can spray hundreds of bullets by holding down the trigger, as contrasted with a semi-automatic that requires each bullet to be fired separately. Even questions about whether armor-piercing bullets can be banned are not resolved by today's ruling, according to Larry Pratt, director of Gun Owners of America. Mr. LARRY PRATT (Director, Gun Owners of America): Well, that's a distinction without a difference, to go after an ammunition ban, say well, that's not a gun. Well, actually, it's to keep and bear arms, and I think we can plausibly argue that ammunition is part of having arms. TOTENBERG: San Francisco District Attorney Kamala Harris says today's court decision will lead to years of confusion. Ms. KAMALA HARRIS (District Attorney, San Francisco): In my experience as a career prosecutor, I've come across some very creative defense attorneys. And I am sure that this ruling today is going to give them yet another reason to come in court and say that their client should not be prosecuted. And I think that they're going to have a pretty good argument because of what was not addressed in this opinion. TOTENBERG: George Mason University law professor Nelson Lund echoes that sentiment. Professor NELSON LUND (Law, George Mason University): There's a very wide door open to challenging restrictions. There are an awful lot of unanswered questions after this decision. TOTENBERG: But Miami Police Chief John Timoney said that while the court battles go on in the coming years, the effect of today's ruling will be immediate. When the federal ban on assault weapons expired a few years ago, he said, Miami saw an immediate glut of such weapons coming from Eastern Europe, so much so that the price per weapon went down dramatically. Timoney began his work as a policeman on the beat in New York in the 1960s. Chief JOHN TIMONEY (Miami Police): I worked the streets of the South Bronx which are pretty tough. But what I confronted back then were zip guns and Saturday Night Specials that were held together with masking tape and electrician's tape. And then over the last five or 10 years, it's the assault weapons. And my sense is, if we don't get a hold of this, what are you going to look like 10 years from now? It's literally going to be Rambo becomes reality, a decade from now. This is what police officers around the streets of America are going to be facing, as the average citizen. TOTENBERG: That prospect, and a totally different reading of history and Supreme Court precedent, is what inspired today's dissenting opinions. In my view, wrote Justice Stephen Breyer, there simply is no untouchable constitutional right to keep loaded handguns in the house in crime-ridden urban areas. Justice John Paul Stevens added, I fear that the gun ban struck down today may well be the first of an unknown number of dominoes to be knocked off the table. Q&A: D.C. Gun Ban Overturned; What's Next? The Supreme Court ruling doesn't mean that anyone can now buy and own a handgun in Washington, D.C. Those who want a gun will still need to obtain a license. Read what else to expect as a result of the court's decision. The Supreme Court's decision on the right to bear arms is the latest milestone in the long history of U.S. gun legislation. Read our selected timeline of key laws. The decision to overturn the District of Columbia's 32-year-old ban on handguns is the Surpeme Court's first conclusive interpretation of the Second Amendment since its ratification in 1791. This is a great moment in American history. It vindicates individual Americans all over this country who have always known that this is their freedom worth protecting. While we disagree with the Supreme Court's ruling, which strips the citizens of the District of Columbia of a law they strongly support, the decision clearly suggests that other gun laws are entirely consistent with the Constitution. I'm disappointed in the Court's ruling and believe introducing more handguns into the District will mean more handgun violence. 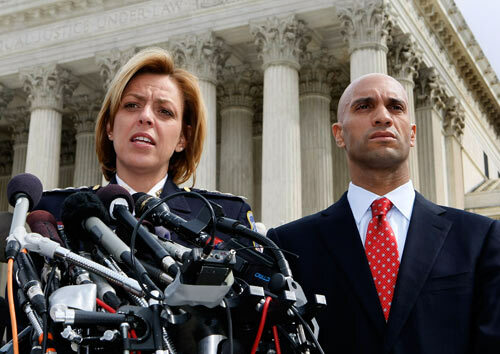 Metropolitan Police Chief Cathy Lanier (left) and District of Columbia Mayor Adrian Fenty face reporters March 18 after the Supreme Court heard oral arguments on the constitutionality of the district's handgun ban. In a dramatic moment on the last day of this term, the Supreme Court declared for the first time that the Second Amendment protects an individual's right to self-defense and gun ownership. For most of the last century, the interpretation of the Second Amendment has been that the right to bear arms is a collective right, such as with military service; Thursday's ruling says gun ownership is also an individual right. The 5-4 ruling grows out of a Washington, D.C., case in which a security guard sued the district for prohibiting him from keeping his handgun at home. In the District of Columbia, it is a crime to carry an unregistered firearm, and the registration of handguns is prohibited. The rules are so strict, they essentially regulate handguns out of existence. The regulations were intended to curb gun violence in the capital city. The ruling struck down the ban on constitutional grounds, saying it flew in the face of the constitutional right to bear arms. The precise meaning of the Second Amendment — "A well regulated Militia, being necessary to the security of a free State, the right of the People to keep and bear Arms, shall not be infringed" — has long been a subject for debate. In a decision nearly 70 years ago, the justices suggested it was a collective right, not an individual right to bear arms. This is the first time the court has defined the amendment so definitively. The two sides in this case viewed the Founding Fathers' intentions very differently. The majority of the justices said the amendment protects an individual's right to possess a firearm unconnected with service in a militia and to use that firearm for lawful purposes, such as self-defense in the home. The dissenting justices said the amendment protects only the right to possess and carry a firearm in connection with militia service. "Like most rights, the Second Amendment right is not unlimited. It is not a right to keep and carry any weapons whatsoever in any manner whatsoever and for whatever purpose," Justice Antonin Scalia wrote for the majority. But it did allow for individuals to have guns for lawful purposes, such as hunting and defending themselves, he said. The majority clearly saw the individual right to own a gun. The ruling will leave intact many of the restrictions in place at the federal and state level, such as bans on a felon's right to keep a gun, and bans on assault weapons and sawed-off shotguns. But Justice John Paul Stevens, in a dissent, said that the ruling leaves it to future courts to define the actual details of the right to bear arms. This should be the business of state legislatures, he said, and the court should stay out of it. Law-abiding citizens will be permitted to keep guns at home, but that doesn't address how state legislatures might want to regulate or curb gun ownership. The court also struck down Washington's requirement that firearms be equipped with trigger locks. In a separate dissent, Justice Stephen Breyer said, "In my view, there simply is no untouchable constitutional right guaranteed by the Second Amendment to keep loaded handguns in the house in crime-ridden urban areas." The presumptive Republican nominee for president, Sen. John McCain, released a statement applauding the decision. "Today's ruling makes clear that other municipalities like Chicago that have banned handguns have infringed on the constitutional rights of Americans," he said. He also took a thinly veiled shot at the presumptive Democratic nominee, Sen. Barack Obama. "Unlike the elitist view that believes Americans cling to guns out of bitterness, today's ruling recognizes that gun ownership is a fundamental right — sacred, just as the right to free speech and assembly." Obama signaled his approval of the ruling in a statement Thursday. "Today's ruling, the first clear statement on this issue in 127 years, will provide much-needed guidance to local jurisdictions across the country," he said, adding that "what works in Chicago may not work in Cheyenne," but the decision reinforced that "if we act responsibly, we can both protect the constitutional right to bear arms and keep our communities and our children safe." The NRA said it will file lawsuits in San Francisco, Chicago and several of its suburbs challenging handgun restrictions there based on Thursday's outcome. Sen. Dianne Feinstein (D-CA), a leading gun control advocate in Congress, criticized the ruling: "I believe the people of this great country will be less safe because of it," she said. The law adopted by Washington's city council in 1976 bars residents from owning handguns unless they had one before the law took effect. Shotguns and rifles may be kept in homes if they are registered, kept unloaded and either disassembled or equipped with trigger locks. Opponents of the law have said it prevents residents from defending themselves. The district says no one would be prosecuted for a gun law violation in cases of self-defense.